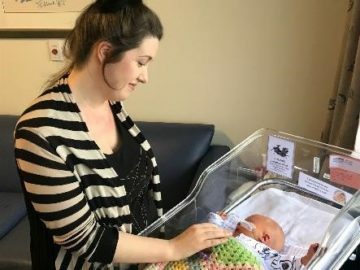 Christchurch Women’s Hospital’s Neonatal Unit (NICU) has a philosophy that where possible, breast milk is promoted as the milk of choice for babies, especially for those born preterm or unwell. To further support this philosophy NICU proudly opened New Zealand’s first Human Pasteurised​ Donor Milk Bank in February 2014. The Human Milk Bank is located on the same floor as the Neonatal Unit with its own storage freezers and staff who undertake the pasteurising of the milk and administrative tasks. The aim is to support mothers who are wishing to breastfeed by providing pasteurised donor milk in the first week after birth until their supply establishes. The milk bank also provides pasteurised donor milk for those babies who are at risk of necrotising enterocolitis (NEC). The benefits of pasteurised donor milk are that the human milk, which is pasteurised for use, contains over 200 components that are useful for growth and health for an infant. It assists the baby to build a healthy immune system and also acts as protection from infections. It contains easily digestible proteins, reduces the risk of bowel problems in preterm infants and contributes to nervous system and brain growth. Feeding a baby with another woman’s breast milk has occurred since time immemorial. In some cases it was merely a matter of convenience when mothers, particularly wealthy ones, did not want to suffer what they perceived as the ‘indignity of breastfeeding’, so wet nurses were employed and this became a thriving industry in some countries. Wet nurses provided milk for healthy babies who were able to actively suckle at the breast, but sick, small premature babies, who were unable to latch and breastfeed, were unable to benefit from being given to a wet nurse for nourishment. The first recorded milk bank opened in Vienna in 1909. Wet nurses expressed their breasts and this milk was given to sick babies. Now there are over 500 milk banks worldwide in 44 countries. The 1980s saw the decline of milk banks, not only due to the rise in HIV infections, but also partly due to the development of formula milks designed for preterm babies by industry. Although it was known that pasteurisation deactivated the HIV virus, (HIV did not result in a decline in blood banking) the perceived costs of screening potential donor mothers and the processes involved in donor milk banking, versus the easy availability of preterm formula, resulted in many, but not all, milk banks closing globally. With increasing knowledge of the unique composition of breast milk and the detrimental health effects of formula milk, the interest in milk bank development has re-emerged globally. The protective components of breast milk such as the immunoglobulins IgA and SIgA, the anti-bacterial/anti-infective proteins lactoferrin and lysozyme, and the many oligosaccharides that provide bioactive factors, prebiotic, immunomodulatory & antimicrobial effects, have helped reduce necrotising enterocolits (NEC) and late onset sepsis rates in NICU babies. When donated milk is received it is stored in a holding freezer until a donors blood test results become available and the milk is cleared for use. Known as raw milk at this stage it can be stored frozen for up to three months until it is pasteurised. The raw milk is defrosted and each donor’s milk is pooled into two to three batches (milk from different donors is not mixed) for tracking purposes. The milk is placed in bottles and pasteurised using the Holder method – heating the milk in a water bath to 62.5C for thirty minutes and quickly chilling the milk to 4C. The milk is then measured into various sized bottles, and refrozen for up to three months for use in the neonatal unit. The Sterifeed Pasteuriser holds up to eight litres of milk. Microscopy samples of milk are taken pre and post-pasteurisation from every batch and the milk is held in a ‘quarantine’ status until results are verified after forty-eight hours. A paper tracking and tracing inventory allows the milk to be tracked from donor to recipient. The below video outlines the process. The Milk Bank accepts breast milk from mothers who have surplus to their own baby’s requirements. Mothers are provided general information about becoming a donor and what is involved. Additionally mothers are asked to complete a health questionnaire​ and have a blood test to ensure that they are free from infections known to be transmitted in breast milk. If the mother is eligible to donate she will be asked to sign a consent form and given further information about the process of expressing, freezing and donating milk. A donor starter pack will also be provided. “After having a premature baby earlier this year it really opened my eyes as to how some babies have such a struggle to the start of their wee life…when I was asked to donate to the human milk bank it was a small way that I could make a big difference to their beginning. The human milk bank is an amazing facility for Christchurch babies and I am so pleased to be a part of this.” Rebecca Eckersley, Donor. ​​The follo​wing frequently asked questions focuses specifically on the types of questions that potential donors commonly ask. 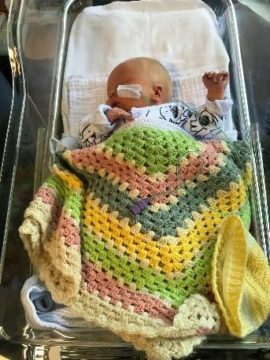 Currently only babies who have been admitted to the NICU and meet our standard criteria can be considered to receive Pasteurised Donated Milk (PDM). The supply to eligible babies is influenced by the availability of pasteurised breast milk. The criteria is regularly reviewed and updated according to milk supplies. Review the standard Human Milk Bank Criteria. This criteria is a general guide but other babies may be considered on an individual basis. The priority is given to those with significant risk factors for necrotising enterocolitis (NEC). All babies should receive their own mother’s colostrum where possible as this milk helps the infants gastrointestinal tract transition from the in-utero environment to the ex utero environment. On Tuesday 4th February 2014 the human milk bank opened its (freezer) doors, making it possible to provide pasteurised donor breast milk to babies in the Christchurch Neonatal Intensive Care Unit (NICU). This is the first hospital-based formal donor milk bank in New Zealand. ​​​The Human Milk Bank now offers a pick-up service for all donations from registered Human Milk Bank donors. 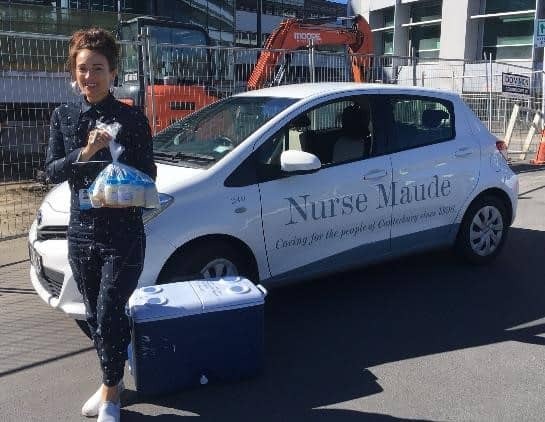 As part of the partnership between Nurse Maude and the Neonatal Unit to provide help for nurses and families/whanau in the Neonatal Unit, Nurse Maude volunteers will provide this valuable weekly community service. Parking is limited around Christchurch Hospital so this service makes life much easier for our donor mothers. What may prevent a mother from being able to provide milk for her own baby? Insufficient supply, if pumping for multiple births (i.e. twins). Is giving babies pasteurised donor milk common? Milk Banking is a common practice across Australasia & worldwide and is endorsed by the World Health Organization, societies within the medical profession and the New Zealand Breastfeeding Authority. What are the benefits of pasteurised donor milk? Contributes to nervous system and brain growth. Is pasteurised donor milk safe to give to babies? Donor mothers have to successfully complete a health screen and undertake blood tests to ensure they are free of known communicable diseases and infections. The Health screen also ensures that donor milk is free from medications/drugs and nicotine. Additionally the Donor milk is heat treated (Pasteurised) to ensure the milk is as safe as possible. Which babies can receive pasteurised donor milk? The medical team use the following criteria to assist in determining who can receive Pasteurised Donor Milk. The purpose of the criteria is to ensure that the most vulnerable of our babies are offered pasteurised donor milk following parental consent. Is there a cost to receive donor milk? Currently Pasteurised Donor Milk is provided free of charge to babies meeting certain criteria who are admitted to Christchurch Women’s Hospital Neonatal Unit. Who can donate their milk? And her baby is less than six months of age. See Human Milk For Our Babies for more information. If I want to Donate what are the blood tests I will consent to? The screening blood tests will include HIV 1 and 2, Hepatitis B and C, HTLV 1 & 2. HTLV 1 and 2 are risk factors for the onset of adult leukaemia and lymphoma. The blood tests are done at no cost to you. Are donors paid for their milk? No. This is a voluntary donation to help our most vulnerable. Where can I find other information about human donor milk?